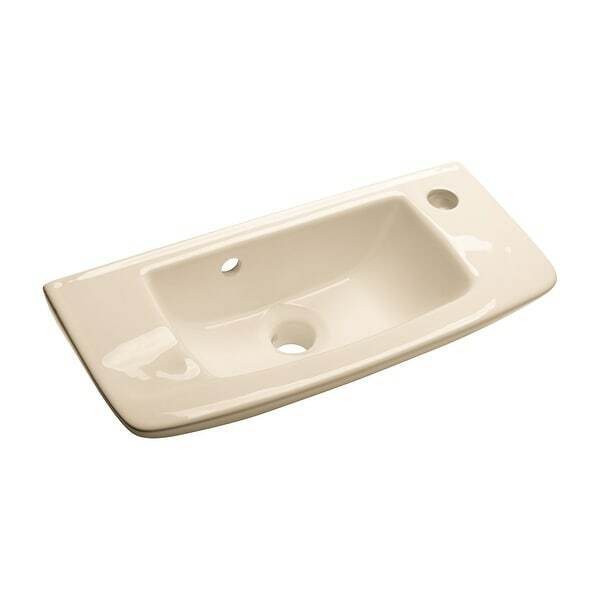 14230This sink is made from durable Vitreous China and features a Self Draining Soap Dish for sanitary storage. The faucet mounting is on the right of the sink and is not included with this item. The space saving size of this sink is 8.25 High x 20 Wide x 9 Projection. This sink is designed to easily mount to your wall without brackets. Simply mount through the casting with hardware appropriate to your mounting surface, rubber washers, and fender washers. Mounting Hardware, faucet, and drain sold separately. This rectangular shaped sink will make any remodel, retrofit, or renovation of a small bathroom space easy to Do It Yourself. ASME Compliant. Dimensions 9.13 In. X 19.75 In. X 8.25 In.